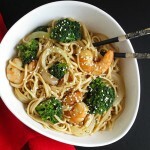 Shrimp and Broccoli Udon Noodles are a fast and easy to dish to make out of ingredients you may already have on hand. Since it is officially Spring, what better theme for this month’s Recipe Redux than to Spring Clean your kitchen by using up at least 3 ingredients we already had on hand. Truth be told, I do this quite often. I keep a well stocked kitchen and there are some weeks I try not to buy much new outside of the necessities to use up more of what I have on hand. 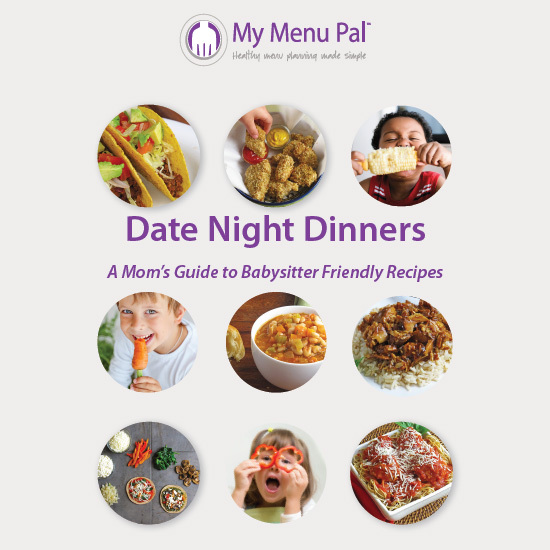 You may be surprised at what you can pull together as long as you have some basic spices and flavorings. What kids don’t love noodles? I know mine do, so I always have a box or two of different kinds in my pantry. I can put just about anything with noodles and my family will eat it. 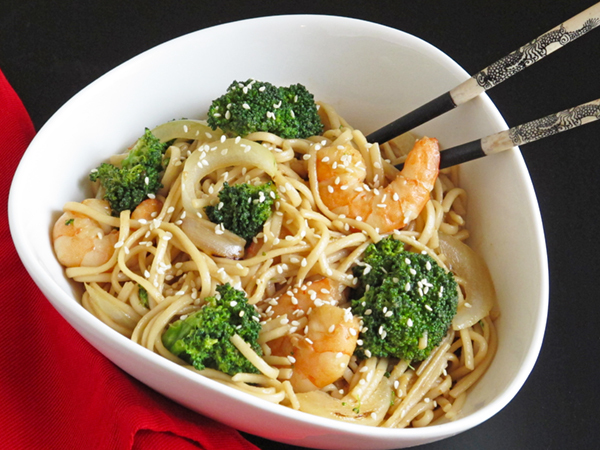 Udon noodles are a thick Asian noodle made from wheat and have a soft, chewy texture. You can find them in the Asian section of most grocery stores and it’s a nice way to shake things up. Though linguine or fettuccine noodles work in a pinch as well. Yes, I know I just made some people faint at the mere mention of that substitution but most people probably wouldn’t notice! 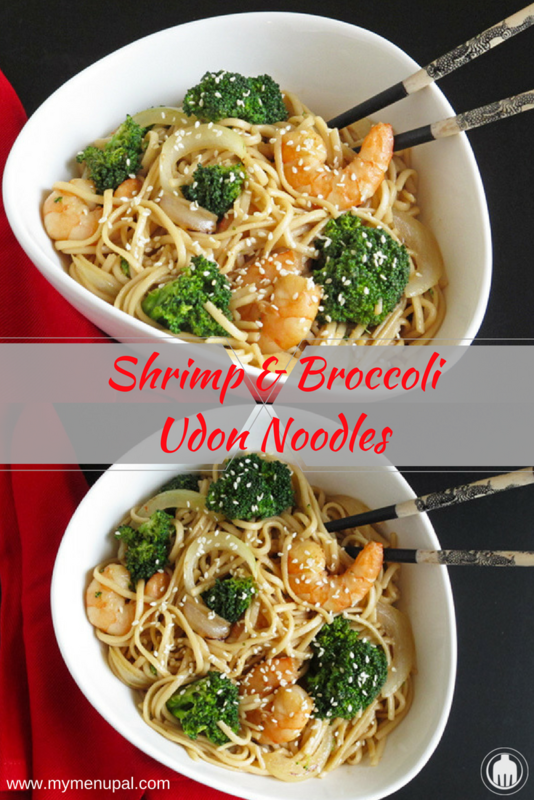 I created Shrimp and Broccoli Udon Noodles a while back on one of those hectic weeks when I needed to use up what I had on hand. While I often have fresh onions and broccoli on hand, I don’t always. Though I do keep my freezer well stocked with frozen versions of these veggies, plus others. Frozen produce is so convenient to keep and it makes meal prep a snap. 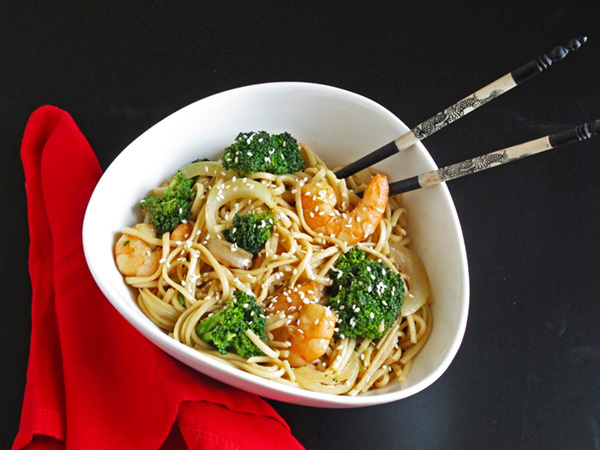 And in dishes like this with such a flavorful sauce, you’ll never notice the difference. Of course any vegetables you have on hand will work in this dish too. It’s very flexible. Shrimp is something my whole family loves, thank goodness. It is quick to thaw and cooks in just a few minutes. If you forget to put frozen shrimp in the refrigerator to thaw overnight (like I usually forget to do), you can put it under cold running water for a few minutes to thaw. Don’t have shrimp or not a fan? Try tofu, chicken or pork instead. And you probably have a jar of sesame seeds lurking in your cabinet – a nice sprinkle on top adds the finishing, though optional touch. Who says you have to order take out when this comes together so fast?! Cook udon noodles according to package directions. Drain and set aside. In a large wok or skillet, heat the oil. Add the onion and garlic and stir fry for about 3 minutes until beginning to brown. Add the broccoli and continue to stir fry for another 5 minutes. 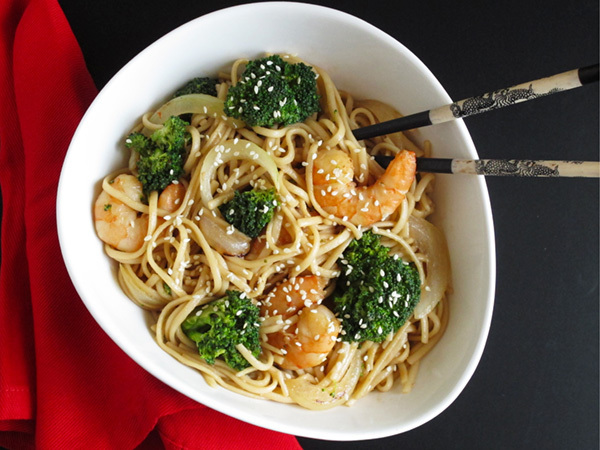 Push the broccoli to the side and add the shrimp to the pan. Cook for another 5 minutes or until shrimp are cooked through. Add the chili paste, ginger, sesame oil, soy sauce and fish sauce to the pan. Cook for a minute and then add the noodles, tossing together well so the sauce is evenly distributed. Cook all together for about 2 minutes or until heated through. Sprinkle with sesame seeds and serve. Mix It Up: Add bell peppers or use other veggies your family likes in place of the broccoli. If your family doesn’t like shrimp, use chicken instead. Chef’s Note: Udon noodles can be found in the Asian section of any major grocery or Asian specialty market. 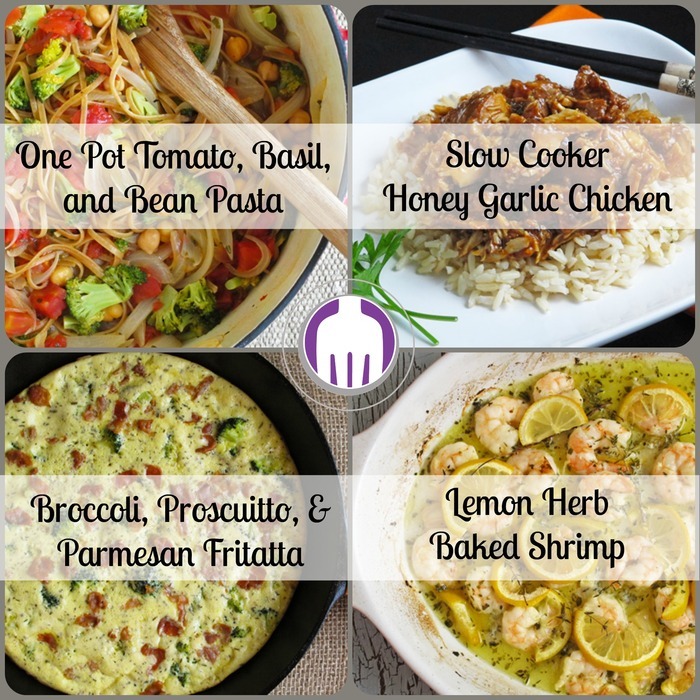 Be Sure To Check Out the Other Recipe Redux Creations!